So, I am experimenting with a new deck, The Ninja Wisdom Deck, which I found unopened among my husband’s books (I looked at him until he said, “oh, would you like to try out this deck?”). I’m not sure yet what I think about the Ninja Deck, which is actually a joke deck along the lines of the Corporate Flash Cards, only a bit more…violent and bloodstained. On the box, it says, “This box looks forward to killing you soon.” So, you know, black belt pacifist that I am, I couldn’t resist the challenge of trying to read with it. 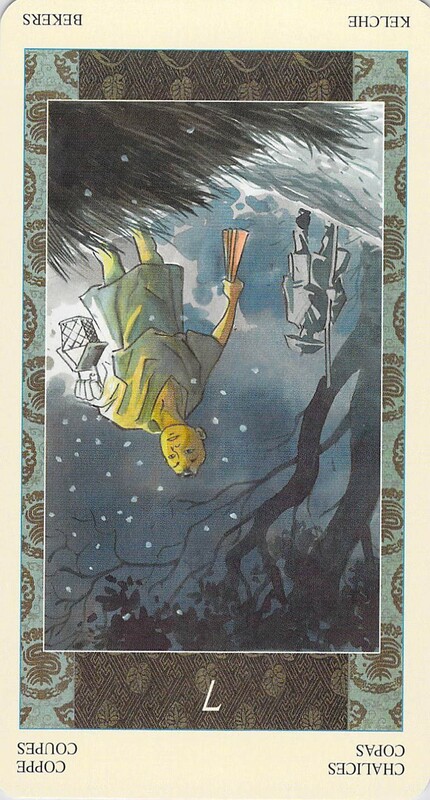 I asked the Ninja deck what it has to tell us about Father’s Day, and pulled two cards: Strangling, and The Sound of Sound. On the back of the Strangling card, it says, “When we all kill alike, no one is killing very much.” On the back of The Sound of Sound card, the quote is simply “Shhh.” Every Ninja card has a quote on the back — some are more helpful than others. No (or very few) images, so I may not bother to scan these particular cards. Though these cards may seem a bit cryptic, I do see a message here about fathers. A big part of fatherhood is not saying everything that pops into your head, and learning to be quiet around a sleeping baby. It sounds like I’m talking about four letter words, but that’s just the tip of the iceberg for fathers. Part of being a father is taking other people’s feelings — your children’s feelings, and maybe also the feelings of the mother of your children — into account. Fatherhood gentles men, and the tool it gentles them with is language, sound, messages, and the need to always consider what message is being sent to the children. Since actions speak louder than words, this tool gentles men not only in their language, but in their actions. So indeed, Ninja deck, “no one kills as much” after they have children. Some fathers may feel a bit strangled by what they can and cannot do since having children — it takes time to find work-arounds for this condition. “Everything you do makes a sound,” the Ninja deck counsels. Not only does everything you do make a sound, but as a father, you are always in the spotlight — so much for secrecy! This is a big part of what’s hard about being a father. Because suddenly, like it or not, you are a role model to an impressionable very small being. 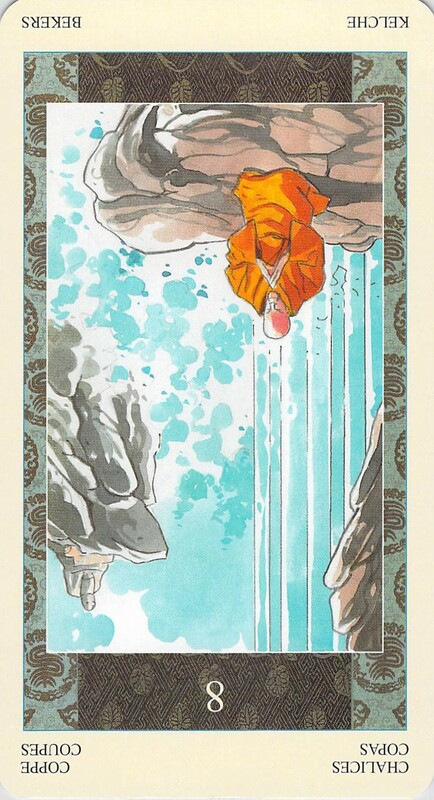 I asked the Samurai Tarot for a bit more clarification of this issue, and got the reversed Seven of Chalices (illusions, and chasing illusions) and reversed Eight of Chalices (relinquishment, a monk meditating under a waterfall). This too, is part of fatherhood: giving up chasing dreams, at least in the heedless way one might have chased them before — having to find work-arounds instead of going for it all out — and relinquishing an old way of life in order to find a way to be who you are in the midst of chaos — rather than alone in a cave in the mountains (or wherever you like to be alone). Previous What Tower Is This? Political Betrayal, a Volcanic Eruption, Both, or Neither? I look forward to your posts and read them faithfully. I don’t always have something to say about them, but I want you to know how much they brighten my day. I’ve become intrigued by your use of the Samurai deck, so I bought one to add to my collection. Thanks for your willingness to share your insights with us. It’s so kind of you to say so! I appreciate it, because I always wonder if I should be spending my time on these posts or coming up with more practical topics to write about. So, thank you! I’m glad that you are enjoying the Samurai Tarot as well — it’s worth it and it gets more and more interesting as you get further into the history on some of the cards. I enjoy whatever you write, so follow your bliss and post away! We’ll be out here reading the posts, even if we don’t always give you the feedback that every writer needs to stay healthy.